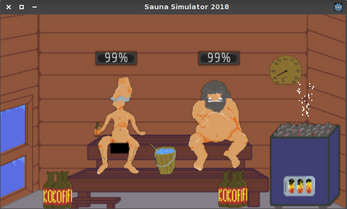 Compete with your opponent on the field of traditional Finnish sauna. Outsurvive him in the boiling heat while trying to stay cool. And should that not be enough, throw some beer bottles at him, that ought to do it. Download the .tar.gz file and extract it to your desired folder. In the Release folder you will find a file called "sauna-simulator-2018". That file is an executable you can run. Enjoy!